Location, Location, Location. They say it's the three most important things in real estate. 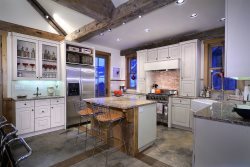 If that's the case then this townhome in Crested Butte nailed it! Located at the corner of Butte Ave and 7th Street, it couldn't be more convenient. With views up Paradise Divide and only 1 block behind the Gas Cafe, it's easy to go on a hike or catch the bus to the slopes. This 3 bedroom, 2.5 bath townhome is sure to be a great base for your Crested Butte adventures. Enter this home through the super cute mudroom, slide off your boots and get ready to relax. On the ground floor level you will find two guest bedrooms, one with a queen bed and the other with a set of bunks consisting of a double on the bottom and a twin on top. There's a full bath on this level with a shower/tub combo and a laundry room. Step out the back door from the bunk room and you find yourself in the quiet fenced in backyard. Up one level you will find yourself in the open living space with loads of windows providing lots of natural light. The walls are a bright and cheery yellow, lending to a space that is perfect for everyone to gather. Kick back on the comfy living room furniture and catch a movie on the 46" flat panel or just relax with a good book. The kitchen is fully equipped and boasts a lot of cooking space on granite countertops. The dining table seats 6 and will be the gathering spot for many a hearty meal or game of cards. A powder bath on this level means no one misses a single hand. Step outside the backdoor to the spacious deck to grill up dinner or sit at the bistro table and chairs with your morning cup of coffee. Back inside, the views out the living room windows of Paradise Divide give this wonderful home its namesake. The master suite encompasses the whole top floor and has a wonderful king bed and office area. The vaulted ceilings provide a nice sense of space and the master bath has a great jetted tub to soak away your cares. Back outside, you're only a short walk to the shuttle stop or all that town has to offer. Summer, Winter, Fall, or Spring, Paradise View is your home base. Exit the house and walk one block to the left (1-2 min) and you'll be at the free shuttle stop just in front of the Gas Cafe. This shuttle takes you either up the mountain base area for skiing,biking, or hiking, Elk Ave. for shopping and restaurants, or right in front of the grocery store for snacks and meal planning. Awesome access for whatever the day entails! We stayed at the Paradise View for a long weekend during ski season. The house was beautiful with amazing views. It is wonderfully located (an easy walk to Elk Street and about a block from the last bus stop to the mountain). We had a great time and will definitely be back! The property is clean, safe, convenient and so comfortable. We would recommend this rental highly! Very convenient. Easy walk to town. Near bus to ski area. Clean comfortable well stocked kitchen. Replies to email were prompt and courteous. Requests for assistance were handled promptly, including outside normal service hours, with our gratitude. We stayed here for a short summer vacation in Crested Butte. We could walk to town easily for dinner at nite. There were some hiking trailheads close. The house had everything we needed. Very well appointed. The only "complaint," and it's a small one, is that the internet service was spotty. Sometimes it worked and sometimes it didn't, but it did work the majority of the time. We walked the very short distance to the Gas Cafe (Shell Station) on the corner for morning coffee and once for lunch. This is going to sound silly, but GO to the Gas Cafe for lunch sandwiches if you stay here. Friendly, quick service and the BEST sandwiches. Seriously. When you see locals flocking here, you get the right idea about the place. (We didn't try the breakfast sandwiches, but my bet is they're great, too.) We'd definitely come back to this house. Had a couple of questions for the property managers, and they were helpful. Great summer hiking accommodations. The property is very nice...I highly recommend. It was perfect...We had two minor issues that were resolved immediately. Great customer service. Walkable to town, very close to town shuttle. Sleep six, but more comfortable for four (small LR/DR area). Good size kitchen, nice grill area on back deck. Master bedroom/bath on third floor is spacious, but privacy is low (no door). Property management very helpful and responsive. Everyone I talked to at Iron Horse was friendly and professional and quickly responded to any questions prior to our visit. Our stay in the Crested Butte house was great. We were in town for a family wedding and the house was perfect for us. And I might add the house has everything you might need to cook your meals but we didn't have time for cooking so we found the gas station/sandwich shop a block away is a great place to pick up a delicious quick breakfast or lunch to bring back to the house and enjoy on the deck with a great view! Knowledgable, responsive team who helped make the holiday enjoyable and easy. This was a nice, clean unit that worked well for a group of guys on a biking vacation. Everything was as advertised and the Iron Horse staff were courteous and responsive. The Iron Horse team is friendly, knowledgeable, and able to answer all questions. They sent the information for check-in one week ahead as promised. It was clear and complete. We loved the location and overall comfort of this property! It was a great place for our family to stay rather than a hotel. It was perfect...We had two minor issues that were resolved immediately. Great customer service. The property is very nice...I highly recommend. Lovely, well-appointed house in an excellent location. The ONLY very small glitch for us was the wifi. It worked most of the time, but sometimes did not. Other than that, absolutely wonderful experience. Thank you. MANAGER RESPONSE I'm glad you had a great time in Crested Butte. I wish you would have let us know about the WiFi, we would have sent someone right over. We look forward to having you stay with us again. Safe Travels! All queries were responded to promptly and in a friendly manner. Thank you for the basket of gifts. We were very impressed with the experience, thank you. We really enjoyed our stay at the property and would stay there again. This was our fourth stay in CB and our best visit to date. Minor point - the property directions specified the house as no.1. There is a 1A and 1B. On arrival that left us briefly unsure about which one it was. It would be clearer to specify the property address as 1B. MANAGER RESPONSE Thank you very much for the suggestion. We have changed the directions in our system for future guests. We are glad you enjoyed the property and look forward to having you stay with us again. Safe Travels! Super clean! Excellent location for shuttle to mountain. Would highly recommend this home.